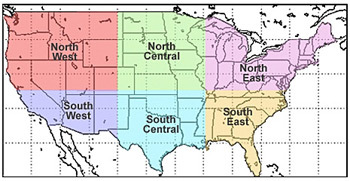 Since April 2001, personnel at the National Oceanic and Atmospheric Administration (NOAA) National Environmental Satellite, Data, and Information Service (NESDIS) Center for Satellite Applications and Resarch (STAR) have been archiving data from six different algorithms from estimating precipitation using data from the Geostationary Operational Environmental Satellites (GOES). See this link for a description of these algorithms. As of 11 April 2003, NESDIS has begun an automatic daily analysis of these satellite algorithms compared to Stage IV radar/rain gauge values (for 6-h totals) and to raingauges (for daily totals). In addition, an archive of the hourly satellite files is available in IEEE binary format. The two maps below show the daily rain gauge amounts for the most recent 24-hour validation period. Click on the first map to get validation statistics computed using all of the 6-h totals (12-18, 18-00, 00-06, and 06-12 UTC) during this 24-h validation period compared to Stage IV; click on the second map for statistics for daily totals compared to rain gauges during this same 24-hour validation period. Here is an explanation of the statistics used.